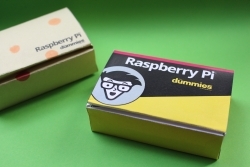 Raspberry Pi For Dummies shows you how to get the best from your Raspberry Pi, whichever model of Raspberry Pi you have. You will learn how to set it up, including connecting it up, downloading and installing its software and configuring its settings. You'll be shown how the desktop environment and the Linux command line can be used to manage your Pi and its files. You'll learn how to browse the web, use free productivity software (LibreOffice), edit images in GIMP and play music and video using the Kodi media center software. In a series of creative projects, you'll discover how to create games in the child-friendly Scratch programming language, program in Python, code music using Sonic Pi, build a maze maker program in Minecraft, and make electronic games that are controlled by your Raspberry Pi. The book also includes inspiring projects, recommended software, and troubleshooting tips. The book assumes no prior knowledge of electronics, Linux or similar computers, so it's perfect for beginners to computer science. We do assume, however, that you've used a Windows or Mac computer before to do things like browse the web and write letters. As you would expect, the book is written in the friendly and accessible style that has made the For Dummies series one of the most popular reference book series worldwide. The For Dummies case, suitable for the Model B+, Raspberry Pi 2 and Raspberry Pi 3. The template case, also suitable for the Model B+, Raspberry Pi 2 and Raspberry Pi 3. With minimal branding on it, you can use this case to make your own designs. The original Raspberry Pi For Dummies case, created for the original Raspberry Pi Model B when the first edition of the book was published. The case design was created by the For Dummies team at Wiley, based on the original template by Ian McPhee, who kindly gave us permission to do this. You can download the example files from the book in a zip file here. You can also download the bonus chapters mentioned in the book at the publisher's website here. The book also mentions my Amstrad CPC games, which you can use on the Raspberry Pi using the Lakka OS. They include a number of games I wrote for Amstrad Action and Amstrad Computer User magazines back in the 80s. If you're looking for a dose of retrogaming on your Raspberry Pi, give them a go! One of the chapters in the book shows you how to use Python to build worlds in Minecraft. As well as showing you how to add and remove blocks in the Minecraft world, the chapter shows you how to create a program that generates random mazes you can explore in Minecraft. Here's a video showing my Minecraft Maze in action. 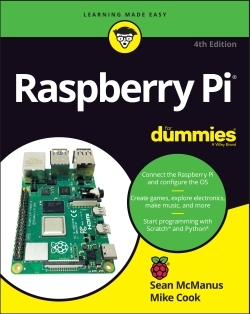 Raspberry Pi For Dummies teaches you how to program, first using the highly visual Scratch programming language, and then using Python. Below you can play the Scratch game you'll learn how to make. To play the game, click the green flag. The game starts straight away: use the cursor keys to steer and the spacebar to fire. Sorry - this requires Flash, and does not work in Internet Explorer. This is purely for demo purposes. You don't need Flash to use Scratch on your Raspberry Pi. If you'd like to learn more about Scratch, see my books Scratch Programming in Easy Steps and Cool Scratch Projects in Easy Steps. The free monthly publication The Magpi published a great review of the first edition of the book in issue 13, shown below. We're also very grateful for the support of The Raspberry Pi Foundation, which wrote a nice blog post about the book on Raspberrypi.org here. 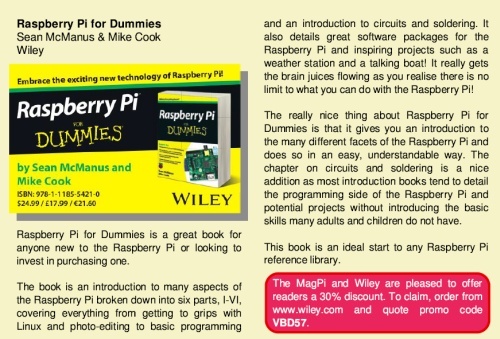 Raspberry Pi For Dummies is co-written by Sean McManus and Mike Cook. Sean McManus is also the author of Coder Academy, Cool Scratch Projects in Easy Steps, iPad for the Older and Wiser (a #1 Amazon bestselling hardware book), Web Design in Easy Steps (a #1 Amazon bestseller in web design), and Microsoft Office for the Older and Wiser. He has written for a wide range of business and technology magazines and learned to program in the 1980s on an Amstrad CPC 464. Mike Cook is an electronics expert with a particular interest in micro controller/computer applications. He has worked as hardware team leader at Pace Micro Technology, and was technical editor of The Micro User and contributing editor to Acorn User magazines.